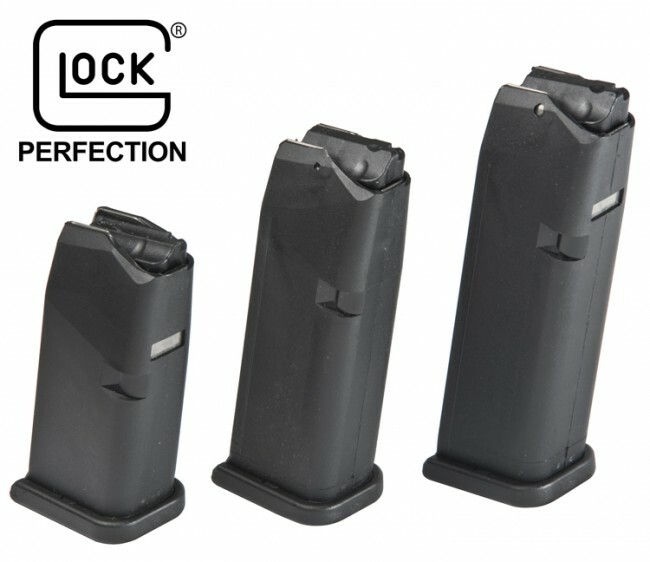 While Glocks are already renowned for their accuracy out of the box, wouldn’t it be awesome to squeeze just a little more precision out of your Glock? Of course it would, which is why you’re here. You can find so many aftermarket parts for various Glock models that you can build your own non-Glock-branded Glock. While we think this is super cool, we’re going to spare you the full rundown on aftermarket Glock parts and focus on just one specific piece today–your barrel. There are many options for your Glock’s shiny new aftermarket barrel. 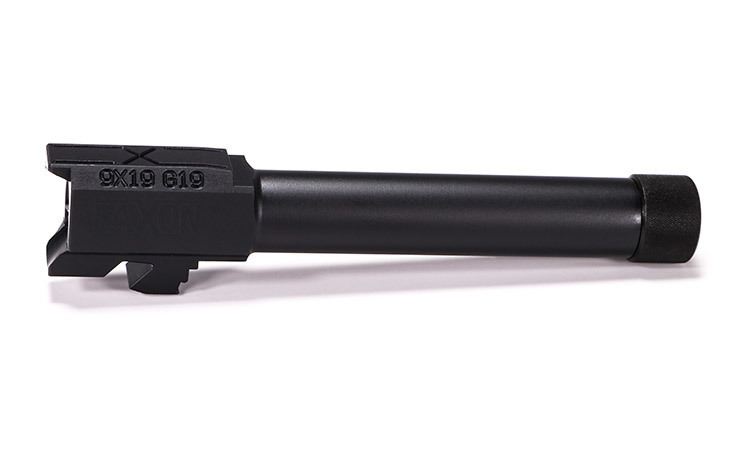 A good aftermarket barrel can offer improved accuracy, prettier aesthetics, and can support aftermarket accessories like suppressors and muzzle brakes. You can improve the functionality of your Glock and personalize its appearance easily, just by switching your barrel for an upgraded version. But, as with any Glock modding project, where do you even start? We’re going to walk you through the basics of upgrading your Glock barrel, from what you need to know to choose the right one for your gun to our top recommendations. You’ll be able to shop for your new barrel in confidence, knowing exactly what you’re looking for. 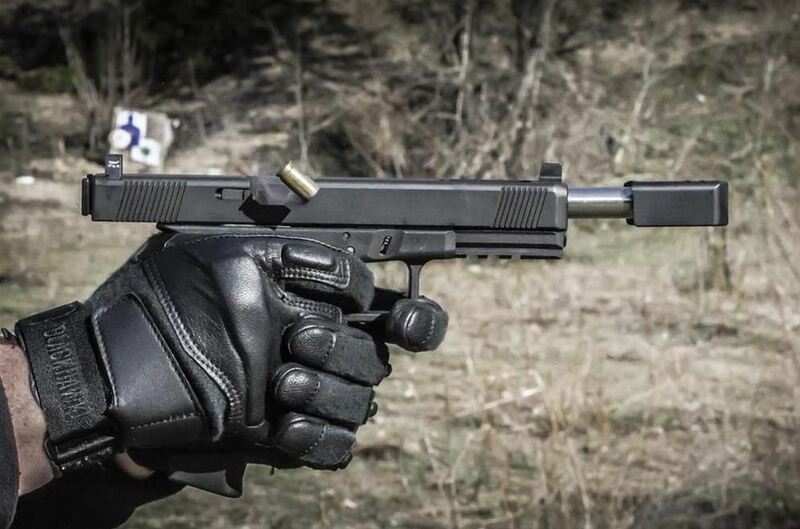 We hear you, but here’s why we think you may want to consider upgrading the barrel on your Glock. 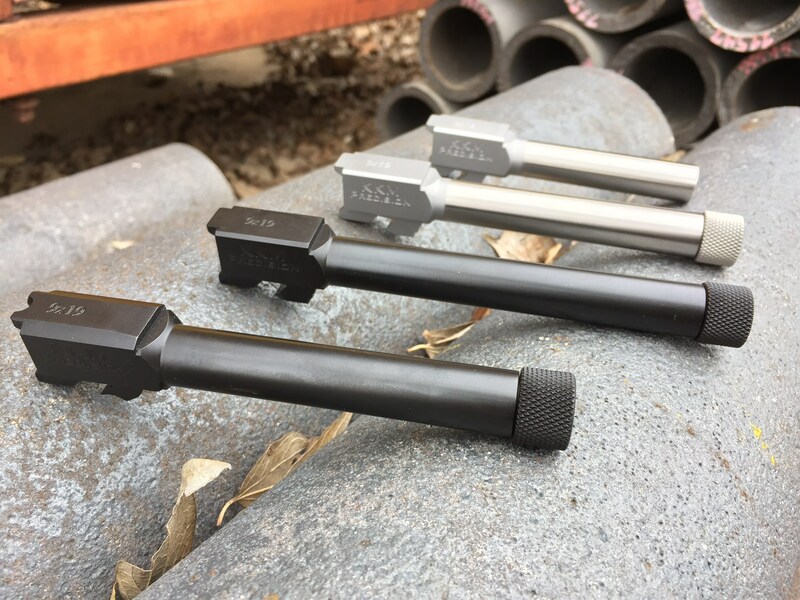 Stock Glock barrels use a polygonal rifling system that is actually more accurate than the average rifling system. It also allows for some cheaper manufacturing processes to be used, and those savings get passed on to the consumer. That said–they do have one shortcoming. They can’t use lead bullets. Glock doesn’t recommend the use of lead bullets in their factory barrels because lead can build up to unsafe levels in the rifling. That means you’re spending more on ammo that will play nicely with your Glock. 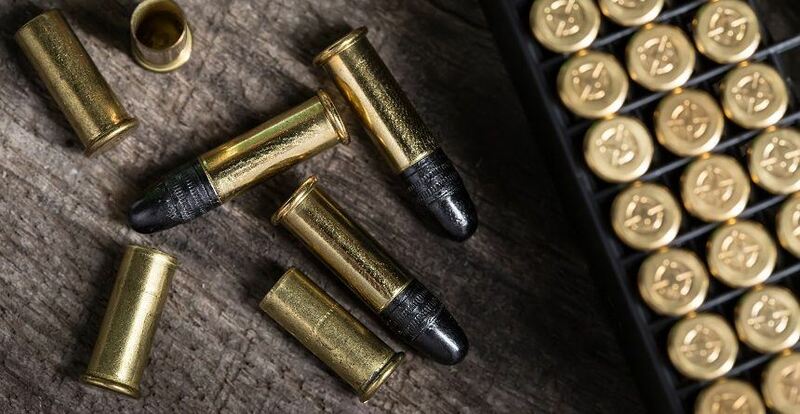 Of course, there are other benefits to aftermarket barrels besides just using cast bullets. For one, many of them are threaded, which means they’re ready for suppressors, compensators, and muzzle brakes. We do like our upgrades for our Glocks, so this is a big draw for us. A Lone Wolf AlphaWolf Bullnose compensator in action. For another, match-grade aftermarket or “accessory” barrels can be more accurate than factory barrels. Glocks are already more than adequate for defensive use or general shooting. For true target precision and to really get the most out of the platform, however, something a little better than stock is required. Aftermarket Glock barrels are also great for improving the appearance of your gun. Let’s face it, Glocks are definitely sturdy and dependable, but they can leave something to be desired in the looks department. Upgrading a Glock is often a pretty painless process. If you want something a bit better looking, a splash of color or just a slightly different finish on the barrel is a great way to add a little something more. When it comes to choosing a barrel for your Glock, there are a number of things you have to think about. 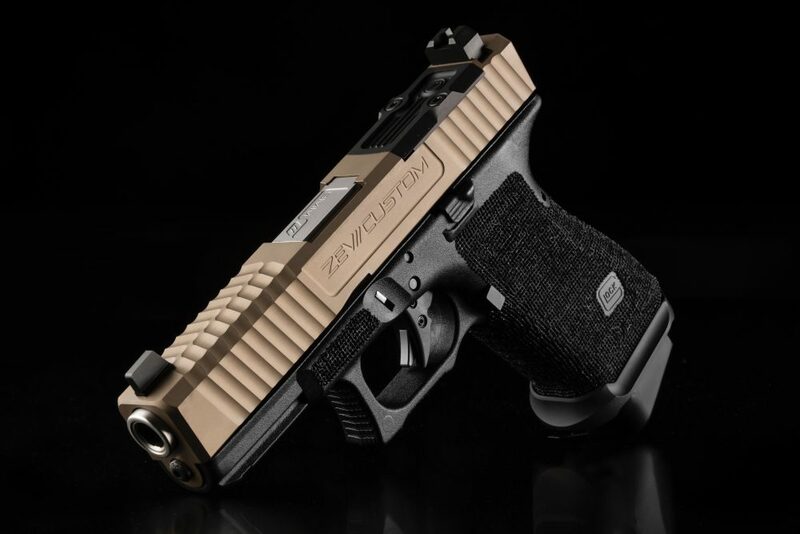 After all, the point of personalizing your handgun means you’re considering your, well, personal preferences. Here are some considerations you might have. First, and really most importantly, there’s caliber. Glocks are available in a host of calibers and it’s important to get a barrel that matches your gun’s caliber. Now, while that’s obvious, somewhat less obvious is the fact that some Glocks can be easily converted to different calibers with just a barrel and mag swap. This is most often done so the shooter can take advantage of lighter-recoiling and less expensive ammo. can be adapted to other calibers. If you’re not looking to change your caliber, be sure to buy the appropriate barrel for your current caliber. In general, you’ll want to get a barrel that matches the factory length for your gun, but there are extended and threaded barrels that are a little longer for various reasons. The threaded barrels are longer to accommodate the threads and still allow your muzzle device to extend beyond the slide. Obviously, it’ll do you no good to have your suppressor in the way of your slide, so a slightly extended barrel takes care of that issue. 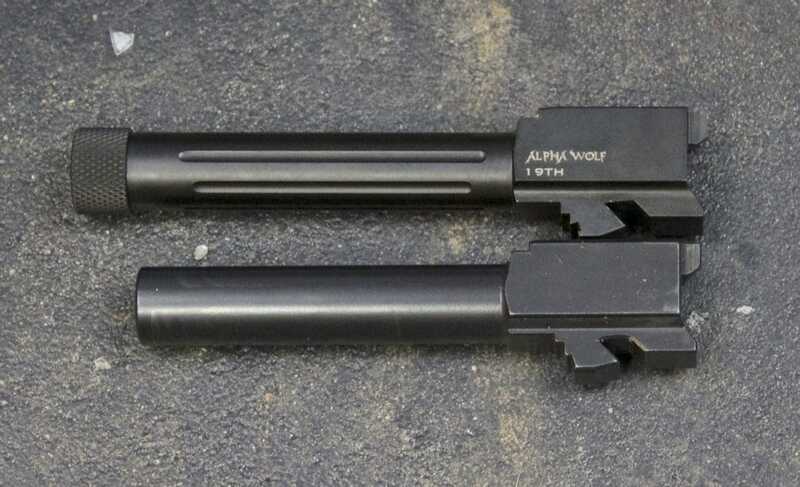 Other barrels, like certain sixteen-inch offerings, may seem a bit silly, but they’re actually intended to be used to avoid turning your Glock into an SBR when you use certain conversion kits. it still looks a little silly. 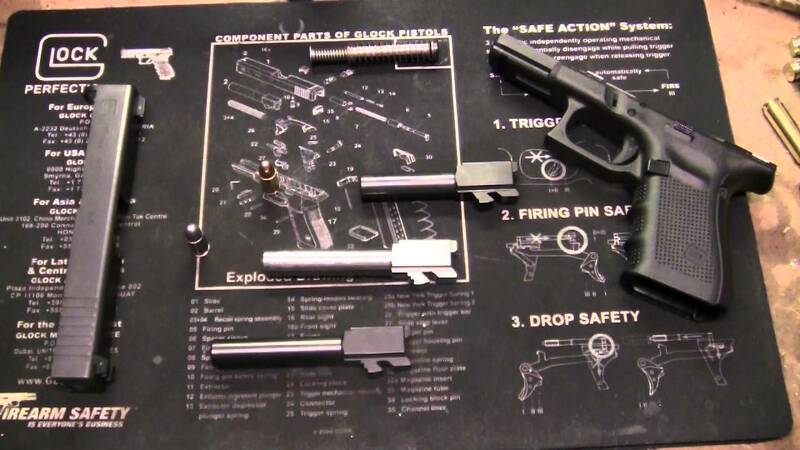 That’s right–there are conversion kits to make your Glock a rifle or carbine. 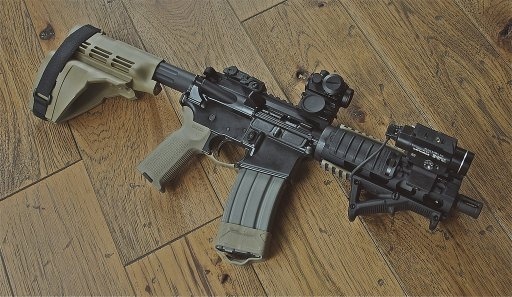 In general, to avoid a tax stamp, you’ll to either have no stock on the conversion or a barrel longer than sixteen inches. Don’t forget to check your local, state, and federal laws to make sure your upgraded Glock is still on the right side of the line. 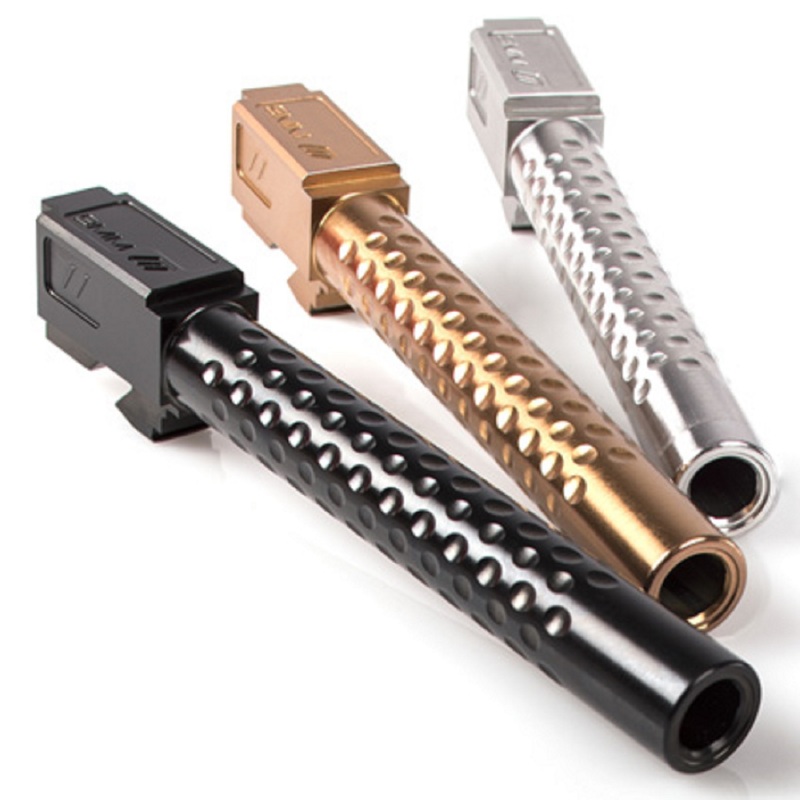 If you plan on running a suppressor, compensator, or muzzle break, you’ll need to get yourself a threaded barrel. If you’ll only be occasionally running a muzzle device, you’ll also want a thread protector to keep your threads from getting gnarled up. Now you may not be interested in any of that, so you could be alright going with a non-threaded barrel. These models are a little less expensive and don’t require the same level of protection to avoid damaging threads. However, if you think there’s even a remote chance you’ll get a suppressor or comp one day, spend the extra $15 or so and get the threaded model at the start and save yourself the $100+ you’ll have to spend on a whole new barrel later. The factory finish on Glock barrels is called Tennifer, and it is widely known for being very robust and corrosion resistant. There are also a wide variety of aftermarket finishes available, from Titanium Nitrides to Stainless Steel. 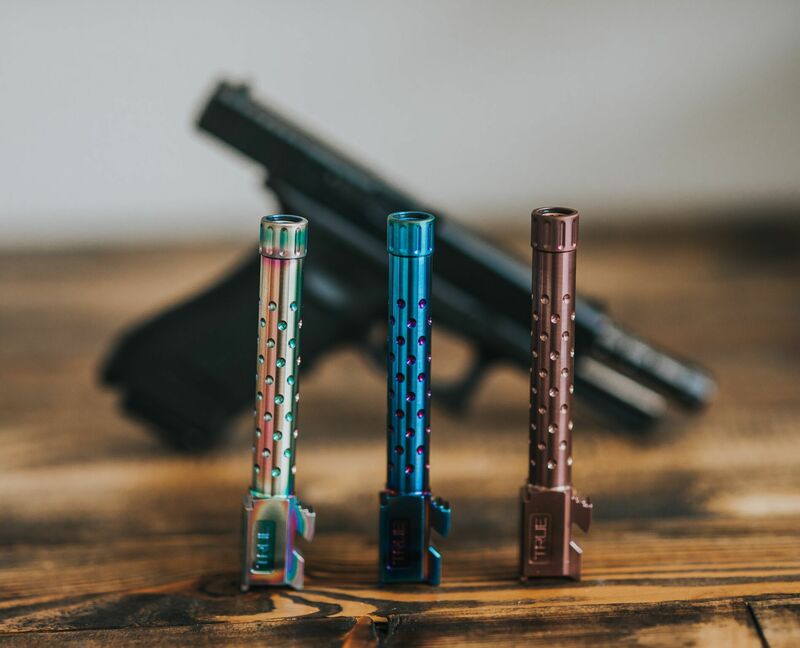 True Precision Glock 17 Barrels in a variety of finishes. 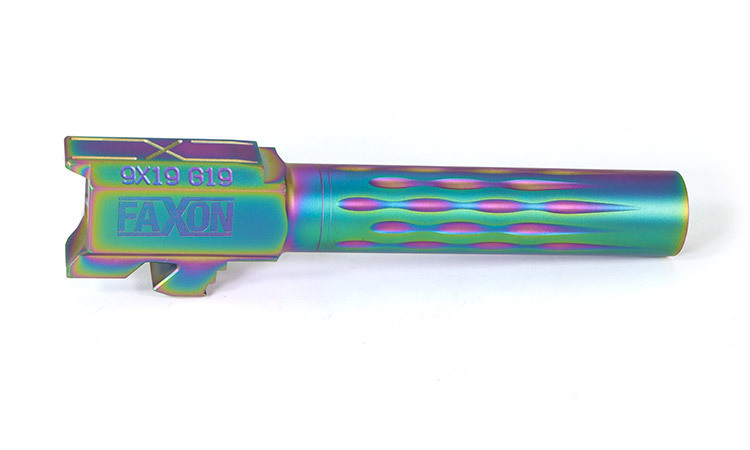 You can also Cerakote your barrel in literally every color of the rainbow, so you have custom options available to you. Many of these options are available from the manufacturers directly, so you don’t even need to pay for a true custom finish. Now that you’re an expert on what to look for in aftermarket Glock barrels, we’re here to tell you which ones we recommend, and why. These picks are our personal favorites, and we think one of them is going to be the perfect barrel option for you and your Glock. Lone Wolf Distributors is probably the most popular aftermarket Glock parts manufacturer. They’re probably the only company that makes every single part you’d need to make a Glock without using any actual Glock parts. Their Glock barrel offerings go well beyond a simple factory-style replacement barrel, however. 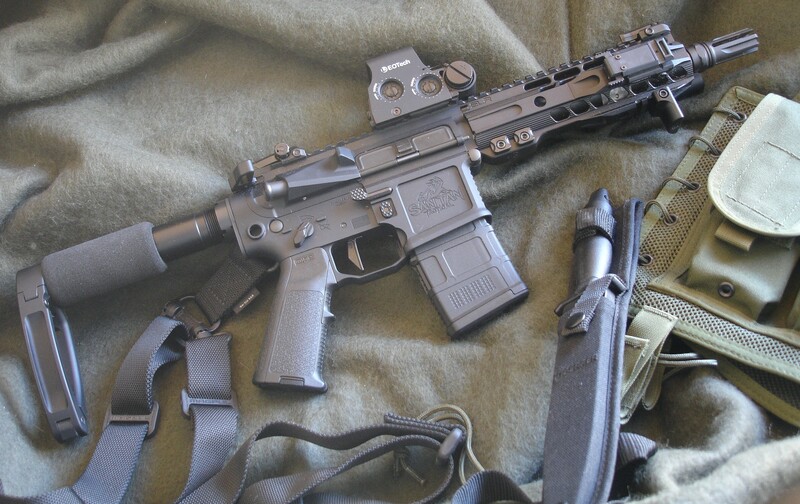 Most of their barrels are threaded, which give you options for suppressors and such. They also have standard spiral rifling that works just fine with lead bullets and cause no issues there. You’ll lose a bit of accuracy if you just do a factory barrel swap with one of Lone Wolf’s standard spiral rifled barrels, but you probably won’t notice unless you’re a very talented shooter. If this is a problem, you can always get match grade barrels that will be more accurate than the factory one you’re replacing. Finally, you can get conversion kits for many Glock models that will allow .40 S&W Glocks to shoot 9mm, or 10mm to shoot .45 ACP, or even full slide replacements that will allow you to use .22 LR. This gives you more flexibility, and in many cases will allow you to train with a smaller (and cheaper) round than you normally carry. Lone Wold AlphaWolf threaded and unthreaded barrels. Lone Wolf truly is the one-stop shop for Glock parts. If you’ve got money burning a hole in your pocket and want to just order a number of parts from a single manufacturer, Lone Wolf is the one you want. Every single Lone Wolf part is high-quality. We’ve never had a bad experience (or heard of someone who has had one), and their customer service is top notch. If you do experience an issue, you’ll be in good hands. If you have looked into modding your Glock at all, you’ve probably seen the name ZEV Technologies. They’re probably the second most popular aftermarket Glock parts manufacturer behind Lone Wolf–and it’s easy to see why. They make exceptionally good (and good looking) slides and their triggers are some of the most popular in the CCW world. 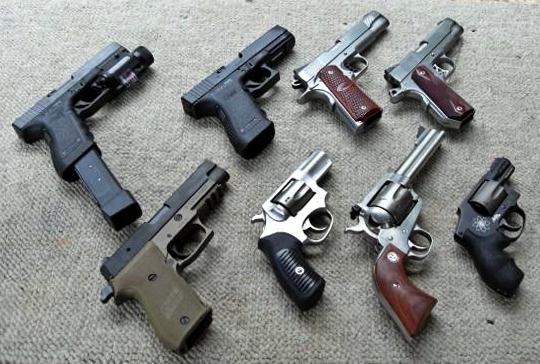 Their components are also incredibly popular among competitors who take their pistol game seriously. Their barrels are what really shine, though–often literally. ZEV makes barrels in a variety of colors and finishes, including gold-colored nitride and rainbow chroma ones. You can really make a statement at the range! 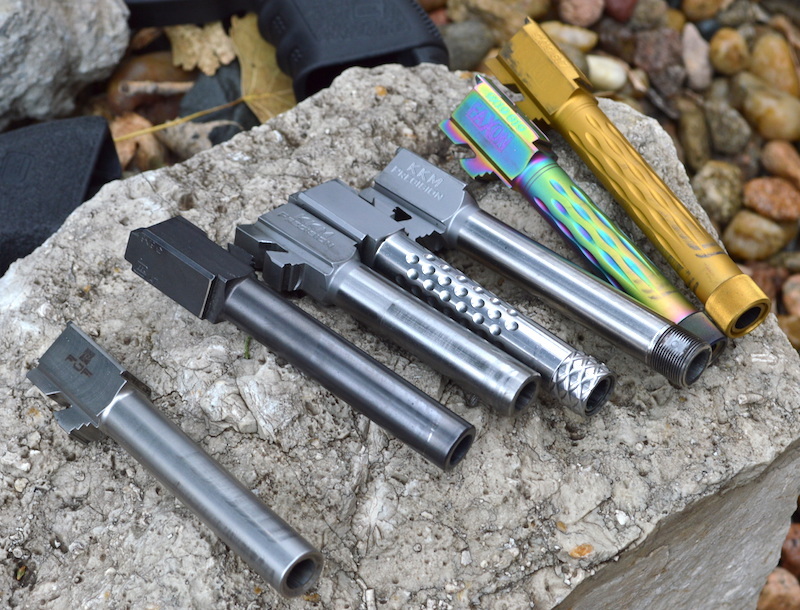 If you’re looking to doll up your pistol, ZEV barrels are a good place to start. And the barrels aren’t just good looking–they also perform great. They make pre-hardened barrels, which are fully hardened before machining. This gives you stronger rifling that will last longer. 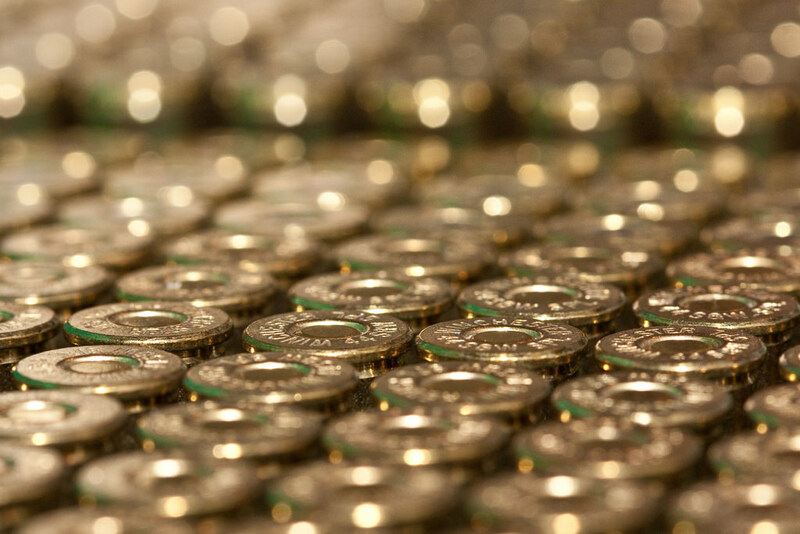 The barrels are also even smoother for a silkier operating cycle, and the finish (even the pretty sparkly one) is actually tougher and more corrosion resistant than the default finish on factory Glock barrels. Best of all, they’re true drop-in barrels, so no hand-fitting or custom gunsmithing is required. 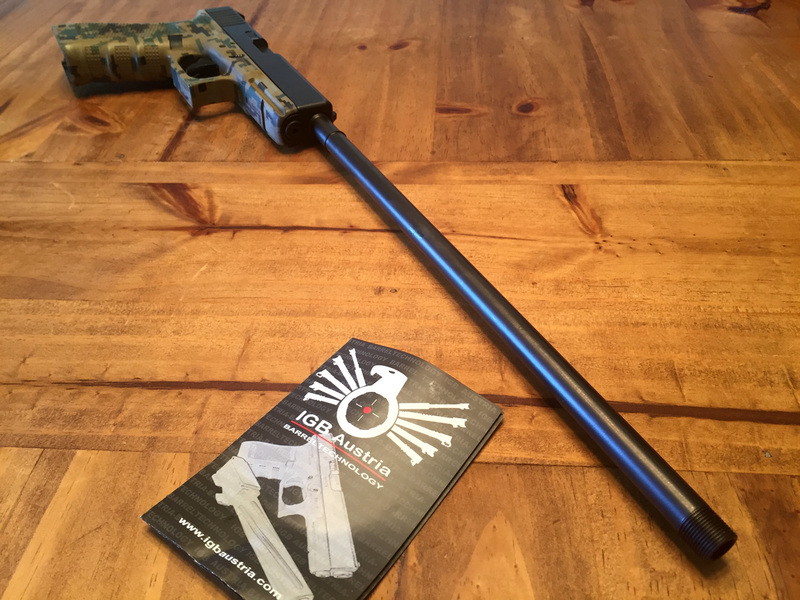 KKM Precision makes barrels for competition shooters and others who are interested in serious target performance. They, of course, look good and function well mechanically, but they’re also designed from the ground up to give you the very best accuracy possible. 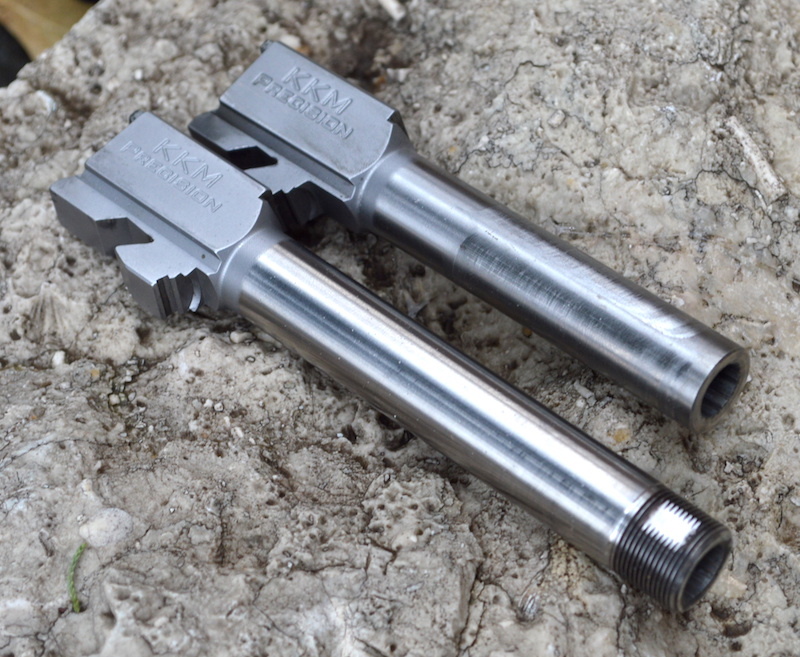 Unlike the other barrels in this list, KKM Precision barrels are button-rifled. This is a process where a tool is pulled through the barrel and, instead of removing material in a cutting action, it actually compressed the inside of the barrel to shape. 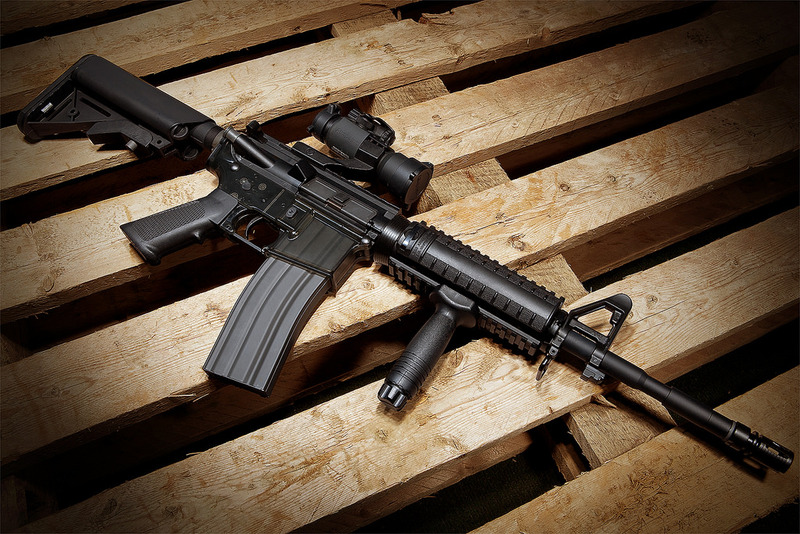 This hardens and strengthens the barrel, and allows for smoother rifling. 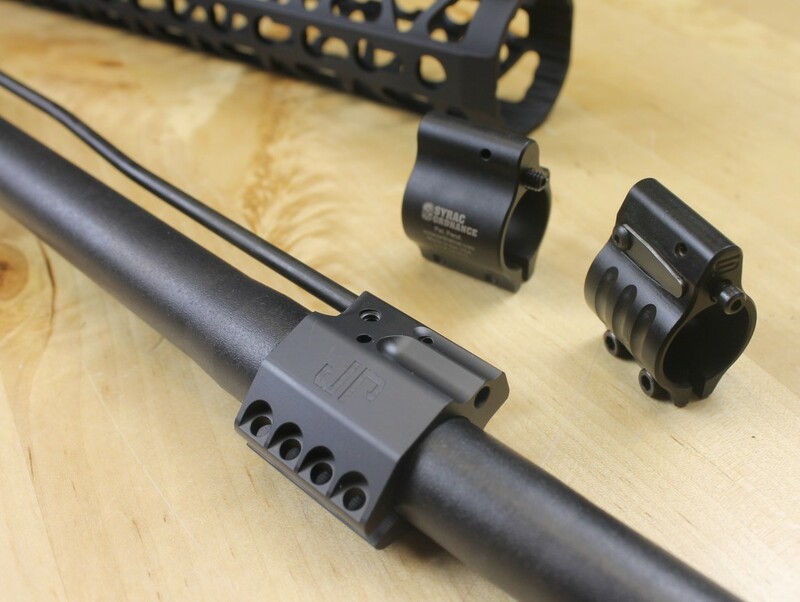 KKM also operates with the tightest possible tolerances in the chamber of the barrel, which does sacrifice some reliability but gives you much better accuracy. All in all, we don’t recommend KKM barrels for carry or duty guns, but if you’re looking for the most accurate barrel around for precision target shooting or competition. It’s safe to say that unless you’re a pro shooter, these barrels are almost certainly more accurate than you are. 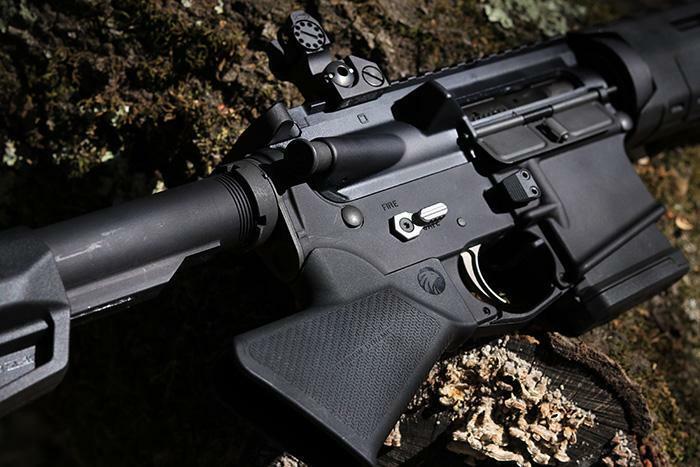 Faxon may be new to the Glock game, but they’ve been making barrels for other firearms, especially the AR-15 and AR-10 platforms, for years. They’re a very good option for those who are looking for a middle of the road barrel that will still improve over a factory barrel… but without breaking the bank. That’s not to say that they’re cheaply made, however. Far from it in fact. 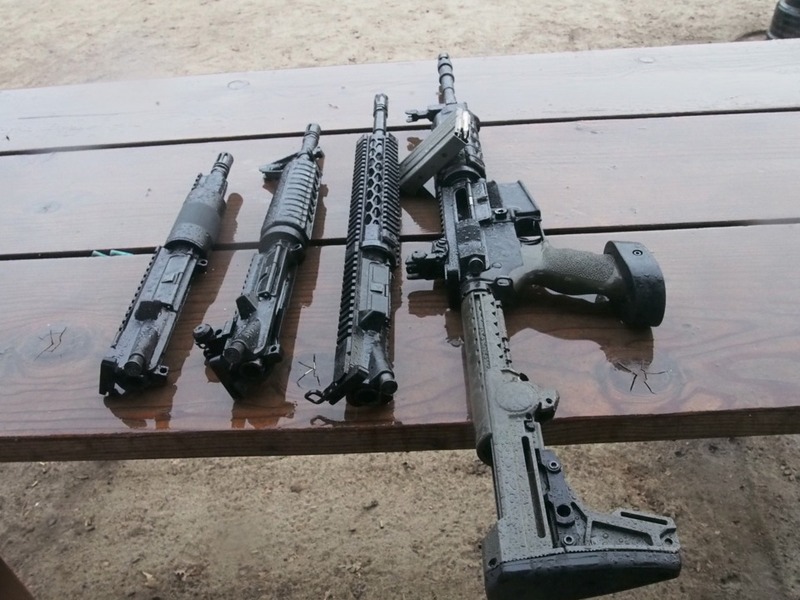 Faxon makes a good quality barrel, and we’d be happy carrying any of them in our Glocks. 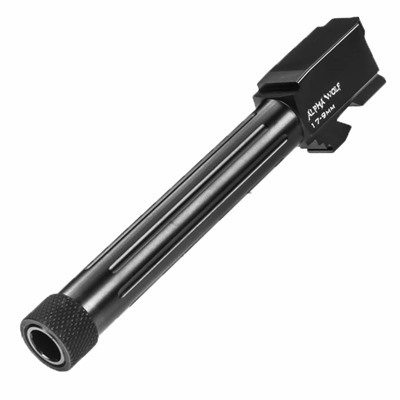 They are closer in performance to the factory Glock barrels than most on this list (for better or for worse) and if you’re looking to simply replace a worn-out barrel with something new, this is the way to go. have the prettiest gun at the range! They also have a staggering number of pretty colors and designs to choose from so you can really accessorize with your accessory barrel. We’re big fans of Glocks for their versatility, accuracy, and how many options are out there to upgrade them. While a barrel may not be at the top of your list for modifications to make, we can’t recommend an upgraded barrel enough for an easy, effective upgrade. Any of the above barrels will serve you well. Now it’s up to you to figure out exactly what you need and choose your new aftermarket Glock barrel! 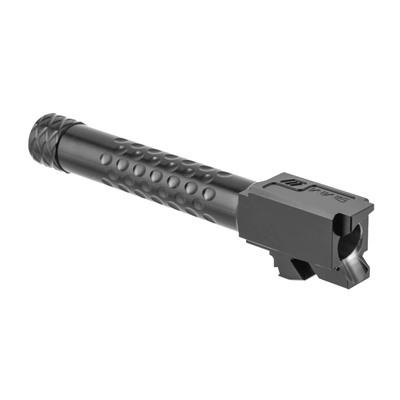 Have you upgraded your Glock barrel with one of the ones on our list? 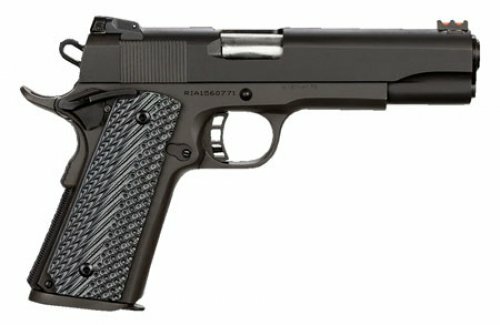 Have a different barrel you recommend? Tell us in the comments below! Don’t forget to read our top picks for best aftermarket Glock slides.